Just as promised, shipped very fast and a great seller ! Extremely fast shipping.. A+ seller! Thank you! I wish I had one for all my handguns! Very snug, but that’s a good thing. Can be loosened if you choose to. Must for pocket bag carry ,you will never worry about having one in the chamber. It fits most if not all 9mm/40 glocks except the 43 as ive been trying it on my other pistols. So the seller isn’t doing himself justice listing it for only 26/27. I wanted some additional safety in carrying a Glock 43 in an Undertech, Undercover shirt. This Kydex Trigger Guard prevents anything inadvertently catching the trigger of the weapon while being carried in this fashion. It adds no weight or bulk to the firearm and works exactly as intended. It has excellent retention and will not accidentally be displaced from the trigger guard until YOU want to remove it. Lastly, the price is reasonable and is in keeping with the amount of Kydex material needed to do the job. The fit and finish is perfect. It is well made and should last many years. This Thing is AWESOME! If you own a Glock, and you don't own one of these, shame on you...you are NOT one of the cool kids. Seriously, for pocket carry this is a must, for the purse or pack, this is perfect. I've secured the included lanyard to a D-ring on my sling bag, so that the guard stays with the bag when my G-26 is drawn from concealment pocket. All one smooth movement. Awesome! 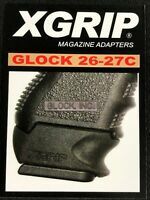 EXTREMELY WELL MADE Trigger Holster for Glock 26 - Superb! 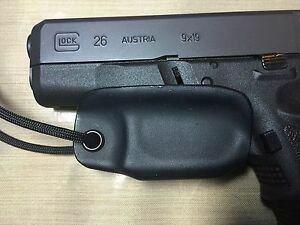 Fits Glock 26 like a glove with an affirmative click. Comes off easily when pistol is drawn. Very, very nicely professionally shaped to the gun with smooth rounded edges. This thing is superb. May need to shorten cord length to optimize for my situation.